The 2018 NPA Convention and Expo will be held at Caesar’s Palace, Las Vegas October 22-25. The National Parking Association Convention is an annual event that provides an opportunity for experts and professionals to learn, network and educate on the diverse topics that are the parking industry. The NPA is a place to find innovations, insight, services and products that will drive the parking sectors into the future and bring new revenue. Parking Sense is pleased to announce they will be in attendance at the 2018 NPA Convention and Expo and would like to extend an invitation to meet with their executives. Learn about Parking Sense and their full suite of Intelligent Parking Solutions. Parking Sense offers an innovative combination of hardware and software products that provide an integrated PaaS (Parking as a Service) platform. Their system install can upgrade existing parking facilities or be incorporated in new parking garage builds. A recent CBRE report found that parking is the number one amenity within the Retail, Office, Industrial and various other property sectors. The importance placed on parking is not surprising considering it is the first impression a customer, client, patron, employee and the like have for a company. Circling lots to find an available space, losing your car in a parking garages and/or hard to find payment stations are all things of the past with Parking Sense and their Intelligent Parking Solutions. The Parking Guidance system offered by Parking Sense will make parking an easy and impressive experience. The ability to drive into a parking facility and have LED lights indicate the available stalls will create a low carbon footprint and increase LEED certification. Users will be excited by the available app that provides maps and payment options. The front end of the Parking Sense systems allows for an impactful first and last impression to all garage users that will greatly increase patronage. In addition to the Parking Guidance system, Parking Sense and their Intelligent Parking Solutions works on a serverless architecture that provides real-time, true accuracy asset and data management. The Intelligent Parking Solutions system allows for an innovative and future-proof parking facility that will increase business revenue. The opportunity to learn about Parking Sense and their full suite of Intelligent Parking Solutions is available to all. 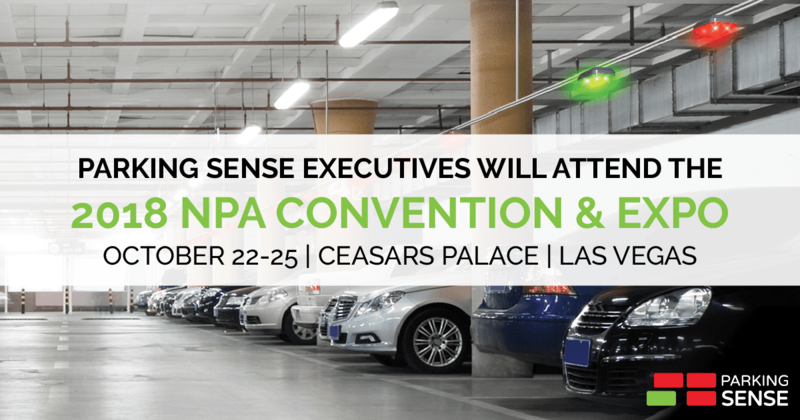 For those attending the 2018 NPA Convention and Expo please click here to schedule a meeting with Parking Sense executives.